Pak Suzuki Will Launch Limited Edition of Mehran in 2018. It is sad news for the lovers of Suzuki Mehran. The year 2018 will bring the end of Suzuki Mehran. 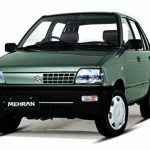 Suzuki Mehran is available since nearly 3 decades of production with zero innovation and now the company has decided to bring the end of Mehran and will launch limited edition of the car. Pak Suzuki has taken this decision in order to jump into the completion with European, South Korean and Chinese manufacturers, thanks to the Auto Policy 2016-21. It is expected that the company will add some features in Suzuki Mehran 2018 which would be the last edition. The company has not revealed the new features which will be in Mehran 2018. Pak Suzuki will be introducing the 660cc Alto as a replacement of Mehran. On the other hand the Pak Suzuki has yet to reveal the official confirmation regarding the end of Mehran and arrival of 600cc Alto. Earlier, Pak Suzuki has declared that it would discontinue Mehran in 2018 and would replace it with 660 CC Alto. Pak Suzuki Will Launch Limited Edition of Mehran in 2018. It is sad news for the lovers of Suzuki Mehran.